When we started Cook’s Country in 2004, We wanted to showcase “country cooking”— honest-to-goodness American cooking, and food that’s meant to be shared with friends and family. We also set out to offer quick, easy, satisfying meals that don’t take hours to put on the table. It’s about simple, great-tasting homemade food—Sunday dinners, potluck suppers, backyard barbecues, and even kids’ birthday parties. These are the kind of recipes and cooking you'll find celebrated in every issue of Cook's Country magazine. And you can be sure that Cook’s Country’s recipes will come out right the first time—and every time —you go in the kitchen. We’ve taken the obsessive recipe development techniques that we’ve polished through years at America’s Test Kitchen (which involve testing and tweaking recipes as many as 100 times until we are certain that anyone who follows them will meet with success) and brought them to Cook’s Country. As we like to say in the test kitchen, we make the mistakes so you don’t have to! Cook’s Country’s mission is to reclaim, revive, and restore classic American heirloom recipes. Dining along America’s culinary trail is a fantastic way to experience our shared experiences as part of America’s great melting pot. 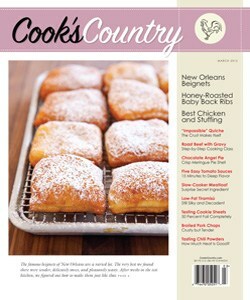 I’d like you to see for yourself, which is why I’m pleased to offer you a FREE TRIAL ISSUE of Cook’s Country. We developed an easy recipe for steaks with a crusty, caramelized, seared exterior and a moist, evenly cooked interior. A simple two-step cooking technique, and a deep disposable aluminum pan will have your steakhouse-worthy meal on the table in under 45 minutes. Green beans and garlic make a great pair for a perfect side dish—but there’s nothing great about waiting an hour for the garlic to roast. A few cooking shortcuts and a splash of a surprising ingredient—red wine vinegar—had our nutty “roasted” garlic beans on the table in just 10 minutes. The secret to authentic, crunchy on the outside, tender on the inside, home fries without pre-roasting or boiling potatoes? We use a microwave to save time—all we needed was five minutes to pre-cook the potatoes to ensure a super crunchy crust in the skillet. A great Marinated Tomato Salad is best modestly dressed—salt, pepper, and good quality olive oil is all you need. But even in the summer, supermarket tomatoes can be a tad bland. While it seemed obvious that marinating the tomatoes in a lively vinaigrette would do the trick, we discovered that the salt in the dressing coaxes a lot of liquid out of the tomatoes and creates a soggy, sorry mess. We actually used this obstacle as the solution. Before marinating the tomatoes, we salted them on paper towels for 15 minutes to draw out excess liquid, which then allowed the tomatoes to absorb the oil and garlic of our marinade. The tomatoes were now bursting with flavor, and they still had a firm, hearty texture. Before the advent of corn syrup, pecan pies were made with less processed types of syrup like sorghum (made from a cereal grass). Today’s ubiquitous Karo corn syrup brings nothing but over-the-top sweetness. We wanted to scale back the sweet overkill and complement rather than overpower the pecan flavor. A combination of three ordinary sweeteners created an old-fashioned flavor that easily bested the pedestrian pecan pie made with Karo. Which brand of tomato paste cuts the mustard? If it can't stand the heat—get it out of the broiler. 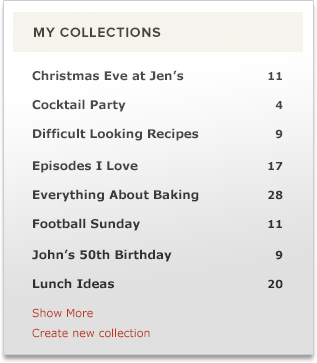 Why should I subscribe to Cook's Country if I already subscribe to Cook's Illustrated? A Cook’s Country subscription is a perfect supplement and complement to your Cook’s Illustrated subscription, as it adds a new variety of classic American and heirloom recipes to your growing repertoire of foolproof meal solutions. The test cooks and writers of Cook’s Illustrated and Cook’s Country share the same test kitchen, but they NEVER share the same recipes. We have a separate staff of test cooks and editors dedicated exclusively to Cook’s Country recipe development. And because the magazines publish on alternating months, subscribers to both Cook’s Illustrated and Cook’s Country will get foolproof cooking information every month of the year! We invite you to try Cook’s Country for yourself. 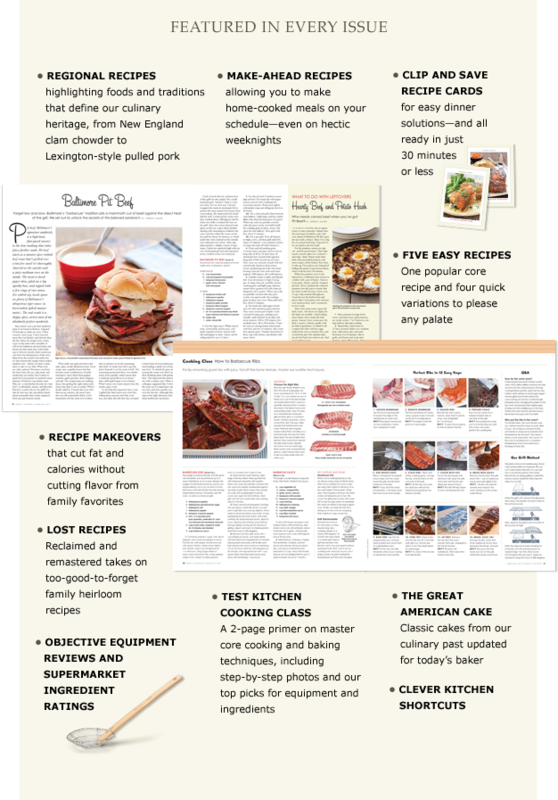 Take just a few minutes now to get your FREE TRIAL ISSUE; if you choose to subscribe and are ever not 100% satisfied with your subscription to Cook’s Country, We will refund the balance of your subscription—Guaranteed. Order your No-Hassle, No-Risk Free Trial Issue now, and see for yourself how easy it is to prepare foolproof weeknight meals!